This month our speaker Chris Stewart told us all about the wonderful work carried out by the charity, Work Aid. This charity collects and refurbishes all manner of old unwanted tools, be they gardening, electrical, mechanical or building. Sewing machines and knitting machines are always in demand. Once refurbished and sorted they are packed up and put into containers for shipping to approved projects. Some of these are in conjunction with the Prince's Trust in this country, but the most part are sent to East Africa. Here people are taught how to use them and thus become able to earn a living and we saw many photographs of very happy people demonstrating their new found skills. Work Aid was founded by a church in Amersham and is run purely by volunteers with no commercial backing. Their logo is 'Tools For Life' and they certainly mean it! If you have any unwanted tools - power or hand, sewing machines etc, Chris is happy to collect and can be contacted through me. Next month our speaker will be Ruth Jones who will be telling us of the benefits of Pilates. Meetings, mostly with a guest speaker are held in the Badgers Mount Memorial Hall at 2pm on the second Wednesday of each Month (not December). Produce stall, teas and raffle at each meeting. New members and guests are always welcome to join us. This photo includes the original founder members which was taken in 1978 at the Silver Anniversary of the Institute. They are Eva Edwardes, Gladys Plumb and Dorothea Elwes. 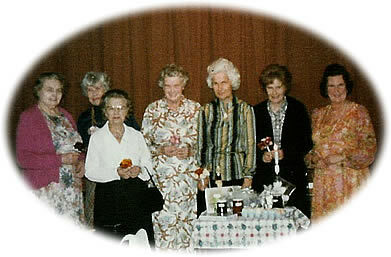 The lady far right is Rita Inwood who was the president then and was re-elected for the Golden Anniversary year (2003). 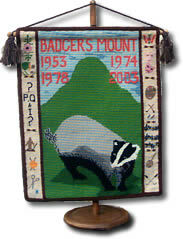 The Badgers Mount WI banner designed and made by the president at the time (1975) Pat West. The banner hangs at every meeting and was the centre of the 50th celebration decorations. Formed in November 1953 by Dorothea Elwes, Gladys Plumb and Eva Edwardes with an average of 26 members attending during the first year. (Sadly none of our founder members are alive to celebrate our Golden Anniversary). 1957 Letters were written to London Transport to get them to re-route the 431 bus for the benefit of the local residents. 1966 We raised money for a new water heater for the hall kitchen. 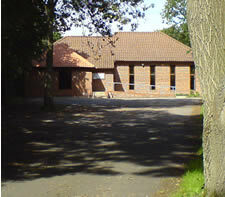 1969 Members helped with a project to extend the hall by 10 feet to allow the addition of 2 toilets, this was aptly named the "Waterloo Project". 1970 A weekly rota was formed to help serve teas at Orpington Hospital's Day Centre. Some members also entertained at the hospital, local OAP clubs and Age Concern. Saving stamps were collected for "Single Women and their Dependents" milk bottle tops for the "Guide Dogs for the Blind Association"
1973 Three of our members were congratulated - Dorothea Elwes who received an O.B.E. Joyce McAughtry who was elected to the Sevenoaks District Council and Kathleen Sherwood who became Divisional Guide Commissioner. 1977 Eileen Back & Patricia Cash represented the WI on a local committee to arrange the celebrations for the Queen's Silver Jubilee, subsequently the institute provided and served teas to approximately 60 children. In this special year we also formed a working party to 'Keep Britain Tidy' armed with plastic sacks we cleared several roads and slip-ways with good results. 1980 Darts matches were held between the recently formed' Badgers Club' for retired and semi retired men from the area and ourselves. 1989 Four of our members enjoyed a week-end at Denman College when the West Kent Federation took over the college. This is our own college set in beautiful surroundings in the Oxfordshire countryside at Abingdon. A number of our members have attended the college either by winning a bursary given by the institute or by paying for a course of their choice. To celebrate the N.F.W.I's 75th Anniversary some of our members ran a 'Tombola' stall at the Kent County Show at Detling, Pat West, Controller of Orpington WI Market and one of our members, helped with the County Market stall at the show. 1990 Margaret Fox & Patricia Cash attended the 60th Birthday Lunch of our 'Link' institute at Hernhill in East Kent. Previously, we had hired a minibus which our then President had driven, to attend one of Hernhill's Coffee mornings, stopping for a pub lunch on the return journey. Over the years, pub lunches have proved to be very popular and we have tried & tested many in the Kent countryside. 1991 We were honoured by a visit from the County Chairmen Elizabeth Patterson, who guided us through the resolutions for the National A.G.M. In the same year, as a result of a talk given by Brian Do on 'Wildlife on the Kent Downs' some members & husbands joined him on a 'Nature Walk' across the downs in April, this was most enjoyable as the primrose & cowslips were in full bloom. 1993 To celebrate West Kent's WI 75th Birthday, Badgers Mount held a Victorian Tea-Party in Margaret Fox's lovely garden, out came the Silverware, lace table linen and Victorian dress & hats. A delicious tea was served to visitors & guests, which included our County chairman, members of other institutes in our Polhill District and some from our 'link' institute Hernhill, by committee members dressed as maidservants. This proved to be a great success in spite of tree-cutting in a nearby garden and a bonfire to burn the wood. During our 50 years we have supported numerous charities, such us local Hospices, Sevenoaks Hospital and Red Cross Society, Pegasus Riding for the Disabled and Kent Air Ambulance to name a few. A Victorian Music Hall, Pantomimes, The Roaring Twenties, Goin' West, As Time Goes By, The Way We Were and a few plays as well, but our "Piece de resistance" has to be our offering for the Millennium - A Midsummer Night's Millennium Dream, a skit on the Bard's famous work, cleverly adapted by Wendy Robertson one of our members. During Millennium year our County Chairman, Brenda Young visited us for our Birthday party. Please visit these local businesses who support this website.